The last time the National Center for Transportation Studies (NCTS) was able to benefit from the acquisition of equipment for research and extension work was in the mid-90’s when the last of the big ticket items like the Horiba mobile air quality monitoring equipment were delivered. These items were donated by the Government of Japan through the Japan International Cooperation Agency (JICA). At the time, there was a strong JICA presence at the Center that included several experts and visiting professors because of the project that transformed what was previously the Transport Training Center (TTC) into the NCTS. Many of the donated equipment eventually showed signs of wear and tear as a lot of researches employed them; some sparingly and others extensively. Of course, there were items such as the mainframe computer, that rapidly lost relevance and value due to the much rapid developments in computers. The problem with big ticket items, as we later found out, was that it was quite expensive to maintain and even operate them. This was especially true for the Horiba, which cost a lot because of the calibration gases required for field experiments and the costly repairs at a time when components had to be shipped to Japan and back because there were no qualified technicians in the Philippines. It was okay back then when JICA maintained a presence at the Center since the experts were able to use their budgets or apply for support for repairs directly to JICA. It became so much difficult later when, after the NCTS Project was concluded, it became just too difficult to get support for equipment repair. After almost 10 years of submitting applications and justifications for repairs or replacements, and promises by JICA experts assigned to national agencies, we practically gave up on the matter and resigned ourselves to the prospect of never getting such important tools in the foreseeable future. In 2007, however, hope was reborn in the form of the Engineering Research and Development for Technology (ERDT) program supported by the Philippines’ Department of Science and Technology (DOST). The ERDT involved a consortium of the top universities in the country led by the University of the Philippines Diliman. It was an ambitious yet realistic program that had the best intentions of giving R&D in engineering a much needed boost. Among the essential elements of the program was the upgrading of facilities at UP that led to the construction of new laboratories and the acquisition of modern equipment to encourage relevant researches. The Institute of Civil Engineering would be acquiring a shaking table for earthquake engineering research, recent-model hydraulics equipment, and long delayed upgrades to construction materials testing machines. In the case of its Transportation Engineering Group, the latter’s affiliation with the NCTS led to the proposals for acquiring equipment that would allow for more progressive studies on Traffic and Highway Engineering. Among those in the wishlist that were approved and have been delivered are a portable digital axle weighing equipment and a portable particulate matter monitoring system. Also approved was equipment that would finally upgrade and revive the Center’s mobile air quality measurement and monitoring system. In fact, the equipment intended for air quality measurements will also benefit the Institute’s Environment and Energy Engineering Group. Such equipment are vital if the University is to be at par with the best in the region and perhaps, if sustained, in the world. The fact that we have been left behind is an understatement and we cannot pursue relevant and progressive researches if we do not have the necessary tools to implement programs and projects. True, we probably have the brainpower to do research considering many have been trained at the best institutions abroad, yet unless we are able to create tools and things straight out from the power of our minds, we are limited and will just end up frustrated about not being able to undertake the research and extension that we are supposed to do, whose outcomes may just spell the difference if this country of ours is to move towards progress and a more prosperous future for its citizens. Valentine’s Day or, to be exact, Valentine’s night is perhaps among the busiest in terms of traffic in many cities. Traffic is often comparable to that experienced during the Christmas season. This is attributed to an increase in the activities during this day that generally includes dating. Malls and restaurants are usually full of couples or families celebrating the day of hearts regardless of whether it is a weekday such as the case this year when Valentine’s is on a Monday. Parks and other recreational places are also full of people who celebrate love by being with their dear ones. There are also concerts scheduled today and the days preceding and succeeding the 14th. Still popular among Filipinos are aging artists who can still belt out favorite songs from yesteryears including the haunting “Foolish Heart” and “Beauty and Madness.” Other artists have already performed ahead of the 14th since the preceding days happened to be during the weekends. 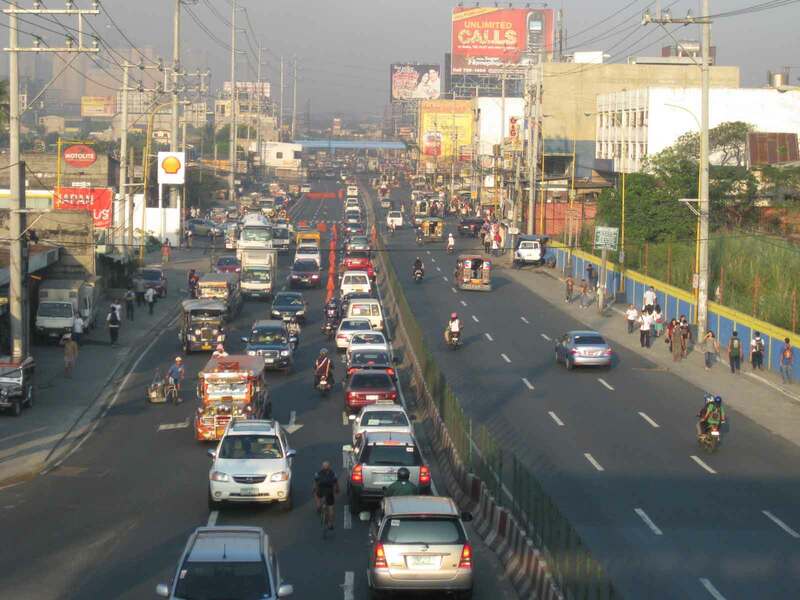 The congregation of people at the malls, restaurants, recreational areas and concert venues often results in traffic congestion in the vicinity of these facilities. I won’t even mention another place where traffic typically peaks this time of year. Parking may also be difficult due to the traffic generating nature of Valentine’s Day. Getting a taxi ride may also be challenging though trying to get a jeepney or bus ride may not necessarily be more difficult than on a regular Monday. Taking a taxi after having dinner on this day is considered a special trip and taxi are popular since they are a substitute to a private car. I know this and other such variations in traffic during the year and it helps a lot when planning routes considering that one needs to avoid roads that are typically congested. This is the sort of information that needs to be provided for travelers in order to reduce congestion along roads that would otherwise be avoided for their association with traffic generators. Ortigas Avenue traffic is very familiar to me. For one, I have used the road since childhood because it was the most direct route to and from school. We lived in Cainta and I went to school for 11 years in Mandaluyong. Before that, I even have memories of the section of Ortigas Avenue where Valle Verde phases are now located being carved quite literally from the adobe mountain that it was back in the mid 1970’s. Ortigas was the only access for those living in the east, particularly the Antipolo-Cainta-Taytay-Binangonan-Angono towsn of Rizal Province, for quite some time. Marcos Highway was still a dirt road and Marikina and Cogeo were somewhat out of the way. Meanwhile, Ortigas was already an important corridor as it led to Antipolo, an important religious and popular recreational site. As the populations of the Rizal towns I mentioned increased, mostly due to their proximity to Metro Manila and being popular for residential developments then as now, Ortigas became congested. The avenue itself was widened but as any traffic engineering textbook will tell us, the bottlenecks were really the bridges. And I also remember the Rosario Bridge across the Pasig River being widened twice, both before the Manggahan Floodway was constructed. I experienced the impacts of both widening endeavors and did not enjoy having to wake up earlier than when I usually did because of the horrific traffic. It was worse, I guess, when the Manggahan Floodway was being constructed and there were too few options as to alternative routes. In fact, there were too few bridges across the floodway and Pasig River. Nowadays, traffic congestion along Ortigas Avenue seem much worse than before. This I get from my siblings who still use the corridor as part of their routes to their workplaces. I trust in their assessment considering that my brother went to the same Mandaluyong school I attended and my sister attended another exclusive school in Pasig. My sister’s husband attests to the worsening traffic as he’s also lived at a residential area along Ortigas. From firsthand observation, I can also validate that Ortigas is worse these days than say 10 and 20 years ago. The counterflow scheme along Ortigas is not new. In fact, my father and our school service drivers knew about this and would often time their trips to coincide with the scheme so that they can drive almost continuously to their destinations in the morning. Back then, I remember that the counterflow scheme was in effect for 10 to 15 minutes at the 0630, 0700, 0730 and 0800 times. It was also actually a regulated one-way scheme and was called thus since it benefited vehicles traveling along the outbound (from Rizal) direction. 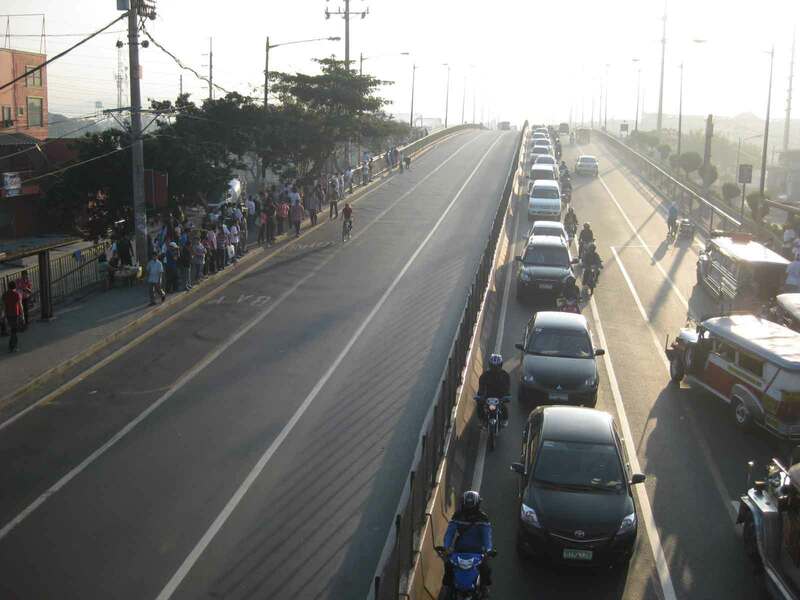 Inbound traffic were stopped at strategic points along the avenue including Rosario Bridge. Such schemes are possible only when there is a dominant direction during the peak hours. In the case of Ortigas the directional distribution before was practically 90% outbound in the morning peak. A one-way, counterflow scheme was possible and practical for an undivided road. There were no medians or island to prevent vehicles from moving over to the opposing lane and back. That was then and at a time when I suppose that there were less friction along the avenue. Road friction, particularly those caused by public utility vehicles stopping for passengers, is more serious these days as the number of PUVs have also dramatically increased to address the demand for travel. Only now, there seem to be more informal terminals and longer dwell times at strategic points along Ortigas. These cause the bottlenecks that are also complicated by Ortigas now having median barriers along its length. I believe congestion can be significantly alleviated by developing and implementing a simple dispatching system for PUVs along strategic points like the designated loading and unloading zones at either ends of the Manggahan and Rosario bridges. The dispatching system should be implemented along with a strict enforcement regime to ensure quick boarding and alighting times and prohibiting PUVs from spilling over and occupying other lanes, that often results in blockage of general traffic. Perhaps, a counter-flow scheme may be re-evaluated and become unnecessary. This recommendation comes in the heels of a survey we conducted along Ortigas only yesterday, February 10 in Manila, where I personally experienced PUVs making a terminal out of the outbound lanes before the Manggahan bridge and effectively blocking outbound traffic along the avenue. I can imagine the frustration of those caught in traffic along Ortigas and its implications along the extension and the Imelda and Bonifacio Avenues from Cainta Junction. The result of that blockage and the implementation of a counterflow around 0715 is shown in the following two photos I took. It is clear from the photos that private vehicles were the ones who benefited from the counterflow. However, it is interesting to see that the outbound lanes were practically empty especially along the Manggahan Bridge. This clearly shows that there is actually enough road capacity but that it is not utilized (and counterflows were required) because of the blockage caused by PUVs upstream of our position. This is another strong case for going back to the basics in as far as traffic engineering and management is concerned. It does not take a PhD degree to see what’s wrong in the photos and certainly an advanced degree is not required for a solution to the problem. After focusing on one negative trait, I didn’t expect to be writing immediately about another. Again, I do this in the context of transport and traffic, and to drive home the point that we really need to go back to the basics in as far as solving transport and traffic problems in this country is concerned. Ningas cogon refers to how a type of grass burns when set on fire. There is initially an intense burning of the grass but after a short time it dies out. This behavior of the burning is often alluded to when describing efforts that are not sustained and especially those that showed enthusiasm (and therefore promise) only at the start. It is also associated with an initial show of interest that eventually and shortly wanes for one reason or another. Only two weeks back I was writing about Commonwealth Avenue and how it was called a killer highway. At the time, I was hopeful that the renewed effort to impose discipline among motorists and especially public utility vehicle drivers and pedestrians would result in a significant improvement of safety along the highway. The initial results seemed to be encouraging, with a dramatic decrease in the number of road crashes and deaths in the first few days. I even had several opportunities to observe the efforts of enforcers, the combination of MMDA, PNP and QC personnel, to keep PUVs along their designated lanes and remind motorists and pedestrians to follow rules and regulations. I was pleasantly surprised, for example, to see vehicles “slow down” to 60 kph instead of the expressway speeds they usually attain along Commonwealth. At the Philcoa area near Commonwealth’s junction with the Elliptical Road, PUVs were being guided through the loading and unloading area and violators were quickly apprehended by MMDA and PNP personnel closely watching the traffic. Meanwhile, I read a few newspaper columns giving mixed reviews about the program. One column in particular from a major daily mentioned that the effort lasted only a few days and that traffic reverted back to pre-discipline zone times. My reaction was one of disappointment, not for the government but for the columnist whom I thought came up with a premature conclusion, given that changing motorist and pedestrian behavior and attitudes along a major thoroughfare would take time. I did mention though in my previous post that enforcement should be firm and sustained in order for it to be successful and enduring. Also, I was already wary of the tendency for such programs to go the way of others before it – ningas cogon. Last Sunday, I drove along Commonwealth on my way to visit my in-laws in Novaliches. I decided to do an experiment using a simple method that I learned when I was a student at University and which I also teach my students in undergrad civil engineering. In what is called a floating car technique, I attempted to travel according to the speed limit of 60 kph. I also tried my best to keep my lane, only changing when it was necessary. I also tried to count how many vehicles would pass me, indicating how many traveling my way were faster than me and therefore over-speeding. The first thing I noticed when I entered Commonwealth from University Avenue was that buses and cars were again zipping by me and so I didn’t bother anymore to count those passing me. I did maintain my speed so I could have a reference as to how fast the other vehicles were relative to mine. Approaching the Fairview Market area, I also observed that people were crossing almost anywhere and that some barriers have been moved to allow jaywalkers to cross the median. Meanwhile, the pedestrian overpasses were all crowded and I could see the entire length also occupied by vendors. Not an enforcer was around to bring order in what was a chaotic marketplace scene – along a major highway. I repeated the experiment in the afternoon when I drove from my in-laws home to my parents’ home. Taking the opposite direction, Commonwealth was even more congested when I approached the Fairview Market area. Buses, jeepneys and tricycles practically took up 3 lanes, stalls, hawkers and pedestrians took up 2 lanes and there was only 1 left for all other vehicles to pass through. No one among those who clogged the highway seemed to care and I again saw no enforcers to mahage traffic. If there were, I’m sure they were somewhere else and definitely not doing their jobs. It is both disappointing and frustrating that the traffic discipline program along Commonwealth went the way of ningas cogon. In fact, the MMDA seemed to have celebrated what they thought was success prematurely, even stating that they were to apply similar strategies to other major roads in the Metro. By the looks of the outcomes along Commonwealth, such efforts along other roads will eventually go the way of ningas cogon. Such results send the wrong message to motorists and pedestrians and reinforce the perception that the authorities don’t really mean business and that such programs are just for show. So far, it seems that this perception will continue to pervade along Metro roads unless the MMDA, the PNP and the respective local government units get their acts together. Again, it shows that going back to the basics remain the main challenge and overcoming the ningas cogon tendency the main obstacle for our authorities. The Filipino or Tagalog translation of the words greedy or selfish seems much more appropriate to use as a term to describe what is arguably the most basic reason why our country is in a rut. It can also be used to describe why our transport systems and traffic is what it is at present. The term suwapang easily and comprehensively defines the way we drive vehicles, ride motorcycles, commute, operate transport services, and enforce or manage traffic. It is also applicable to the way we plan and build infrastructure. Public utility vehicle drivers are suwapang when they cheat on fares for students and senior citizens, refusing to give the discounts mandated by law. The are suwapang when they race to overtake fellow drivers in order to get to passengers waiting along the roadside. They never mind the safety of their passengers or those in other vehicles around them. To them, the most important thing is to get ahead of everyone else even if in the end those waiting along the roadside or the stop weren’t even heading their way. PUV drivers are suwapang, too, when they cut trips, making it difficult for passengers to get a ride home, to school or to their workplace. Suwapang is also the word appropriate for those refusing passengers for one reason or another. Public transport is, after all and definitely above its business aspect, a service. Motorcycle riders are suwapang when they disregard traffic rules and regulations and weave in traffic, placing themselves and others at risk of getting involved in a road crash. They are suwapang when they carry more than one other rider (angkas) as what we commonly observe along many roads and with children sandwiched between their parents who seem to not understand the risk they are exposing their children and themselves to. Tricycle drivers are suwapang when they travel along national roads or highways, fully aware that they are prohibited from doing so. They are suwapang when they charge exorbitant fare for “special” rides. The word also applies when they clog streets due to their numbers, many probably even illegal or colorum units. There are actually too many of them in many areas but they are still steadily increasing as newer tricycles are accommodated or tolerated by the ones supposed to be regulating them. Transport operators are suwapang when they cheat on vehicle maintenance and place passengers at risk of being involved in a road crash. Poorly maintained vehicles also lead to higher fuel consumption and would definitely have a significant impact on operational costs that is part of the basis for setting fare rates. Suwapang is the word for those who operate gas guzzlers while claiming that it is wholly the rising fuel prices that are to blame for their rising fuel costs. These operators unfairly lobby for increasing fare rates while not doing their part on maintaining their vehicles, effectively imposing the fuel inefficiencies of the vehicles on the riding public. Commuters are suwapang when they pressure drivers to stop where public transport are restricted from loading and unloading passengers. They do not care about the driver being apprehended and probably paying up for the violation. Commuters are also suwapang when cheating the driver for fares like when they choose or insist to hang on to jeepneys and not pay fares or pretend that they have paid when they have not. They are also suwapang for waiting on the road rather than the road side. They cause congestion because they occupy space intended for vehicles and in effect reduce the capacity of these roads. Private vehicle drivers are suwapang when they overspeed and weave aggressively in traffic. They do not care about the safety of others nor about rules and regulations that are in place for everyone’s well-being. They are suwapang for demanding more road space when the collective volume of private vehicles are the real cause of congestion, especially when one realizes most vehicles carry only 1 or 2 passengers including the driver. It is inefficient use of road space at best aside from being a waste of fuel and unfriendly to the environment due to the emissions they produce. They are also suwapang when they do not have off-street parking where they reside and leave their vehicles to occupy precious road space, reducing capacity and contributing to traffic congestion in the process. One is also suwapang if they still have sirens (wang-wang) installed on their vehicles for their convenient use, despite the no wang-wang policy being implemented. Traffic enforcers are suwapang when they extort money from drivers instead of issuing them the traffic ticket for legitimate violations of traffic rules. They are more suwapang when they unscrupulously apprehend motorists for what the former claim were violations by the latter but are actually not, in order to eventually extort money from them. These are quite awkward situations since either or both parties may not even be knowledgeable of the rule or rules that were violated in the first place, if any. Enforcers are also suwapang for extorting money or tong from drivers of goods or freight vehicles. Their activities only lead to an increase in the prices of commodities such as rice and vegetables. Our government leaders, planners and engineers are suwapang for poorly planned, designed and prioritized infrastructure. Perhaps some are more concerned with their cuts in the budget for transport infrastructure than the quality of a project and its overall benefit to the public. They are suwapang because they choose to benefit themselves (sarili) over the good of their country (bayan), securing their pockets and their own futures when they should be securing the future of the nation as is required of those in public service. They are suwapang because they hinder the nation’s development and deprive people of an efficient transport system for both mobility and accessibility. Some in the private sector are considered suwapang for collaborating with politicians, planners and engineers described previously. They can also be considered suwapang for pushing for projects that should not be prioritized but are assessed to be so due to their connections with people in power. They, too, hinder this country’s development and deprive people of the efficient system they deserve. So the inevitable question is – Are you swapang?